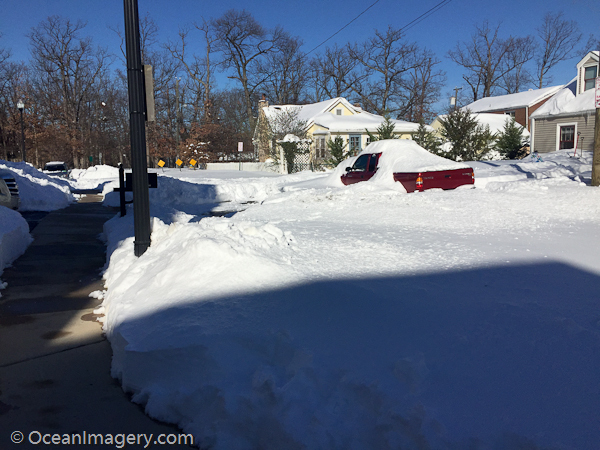 “A view of our totally snowed-in street” – #blizzardof2016 – Arlington, VA.
As most everyone in the United States knows, the East Coast got hit with a huge snow storm this past weekend and it left the Washington, DC metro area with some crippling snow fall totals. At our place in Arlington, we measured a total snow fall accumulation of between 22 and 24 inches (depending on where you stuck the yard stick.) The snow started falling on Friday and didn’t stop falling until Sunday, but it wasn’t until Wednesday afternoon that we could actually get off our street. Here are some pictures from the event. One of the players on the KCIHL Maple Leafs was nice enough to post and share the entire game footage from our Lower C League hockey game at Kettler Capitals Iceplex in Arlington, VA. This was a normal Friday night KCIHL Adult League game between my team, the Ballston Tropics and the Fairfax Maple Leafs. What’s neat about this video is that two Go-Pro cameras where used to film it, one behind each goal, and then the video was spliced and edited to show the action at both ends of the ice… real time! Nice job guys!! BTW… the video should start in the second period @31:15 where you will see the sweet back-hand goal I had to give us the lead. If you want to watch the entire game, just scroll back to the beginning of the video. Another good game and great team win! Go Tropics! !